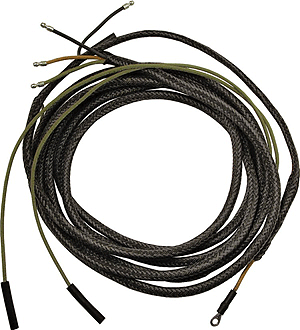 The 1939-40 V8 tail light extension wire harness plugs into the main dash harness or headlight harness (depending on year). It runs along the left side of the frame and includes leads for the gas tank sending unit, stop light switch, left tail light, and rear license lamp (when applicable). (Use B-14424 crossover wire for right tail light).